Home Companies Sheng Fa Li Plastic Toys Products Co., Ltd.
SFL1027 refreshing dog pet pool that pets can use to cool off in on hot days. Our Dog Pet Pools are made of extra-tough PVC that folds down completely for transport and storage. Features: -Dog pools. Available in Small, Medium or Large sizes. -Material: PVC. -Perfect for a refreshing dip in the backyard, or on decks or patios. 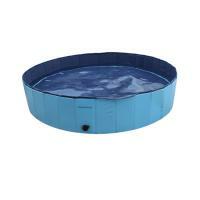 -Dog pools are portable, easy to fill and empty, and are made of extra-tough PVC for lasting use. -Pools fold down completely, making them easy to pack for summer vacations. -Easy to store during the winter months.! 2.All of our product meet 6P,CE,EN71 and ASTM standard.